Pic. 1 - Topology Diagram. Routers and switches are already configured as per the topology diagram. 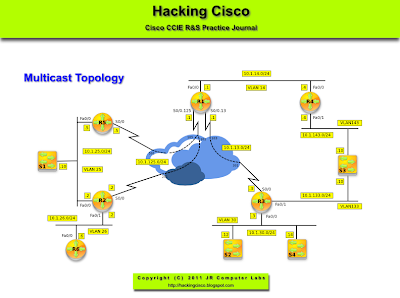 IP Multicast routing is enabled on all devices. Configure a solution for Video Conferencing software using 225.5.5.5 group address. R1 should be the distribution point of this single shared tree. Pic. 2 - Mroute Table on R5. On every network segment and point-to-point link, all PIM routers participate in a procedure called DF election. The procedure selects one router as the DF for every RP of bidirectional groups. This router is responsible for forwarding multicast packets received on that network upstream to the RP. The DF election is based on unicast routing metrics and uses the same tie-break rules employed by PIM assert processes. The router with the most preferred unicast routing metric to the RP becomes the DF. Use of this method ensures that only one copy of every packet will be sent to the RP, even if there are parallel equal cost paths to the RP. A DF is selected for every RP of bidirectional groups. 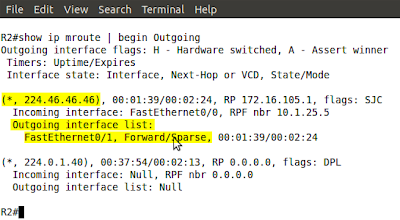 As a result, multiple routers may be elected as DF on any network segment, one for each RP. In addition, any particular router may be elected as DF on more than one interface. OMG, it is already December! What happened to all previous months?! Did I doze off or something? Nah! It was the work. All the work and no play (or study) make J a dull boy. Configure multicast sparse mode between R1 and R2 on WAN link. R1 should be configured as RP. An application on VLAN 26 will broadcast UDP traffic to port 30000. Configure routers in such a way as to allow this broadcast to be converted into multicast 239.1.1.1 address on the WAN link between R1 and R2. This traffic should be converted back into broadcast on VLAN 14. 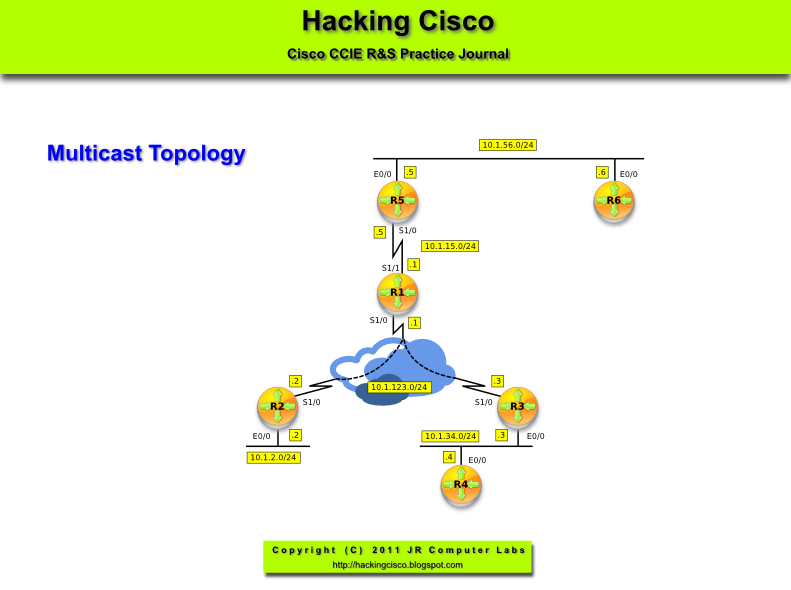 For the Task 2 configuration to work (broadcast on Fa0/1 of R2), the multicast has to be enabled on Fa0/1 interface of R2. ACL entry with UDP 53 port (domain) was added only for testing purposes here. 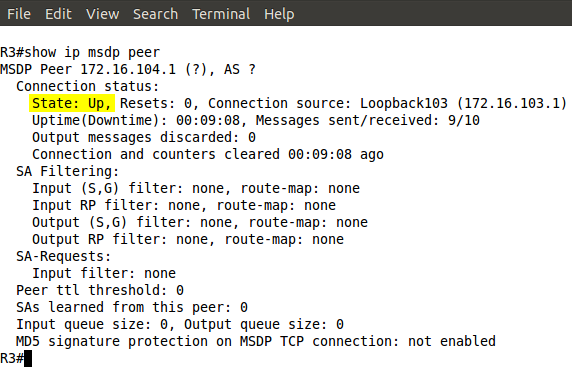 On R6 I have enabled ip domain-lookup and mistyped the command in the privilege mode to create UDP broadcast port 53. 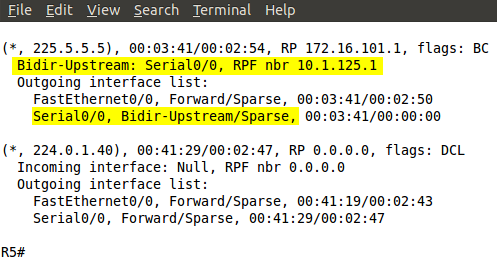 On R4 I have created an access-list enabled debug ip packet using it to see if R1 is sending broadcast. The results are below. Pic. 2 - R2 Forwards Broadcast as Multicast. Pic. 3 - Debug IP Packet on R4. Routers and switches are already configured as per the topology diagram. Configure R3 so that it limits the overall multicast traffic (the aggregate rate) to 5 Mbps out its F0/0 interface. The same interface should limit the traffic to IP 224.1.1.1 to 256 Kbps for every multicast traffic source to this group. If the command 'ip multicast rate-limit' is used without a destination (and possibly source address) access-list, it limits the aggreate traffic. In case ACL is defined, it limits the traffic to a given value per source. 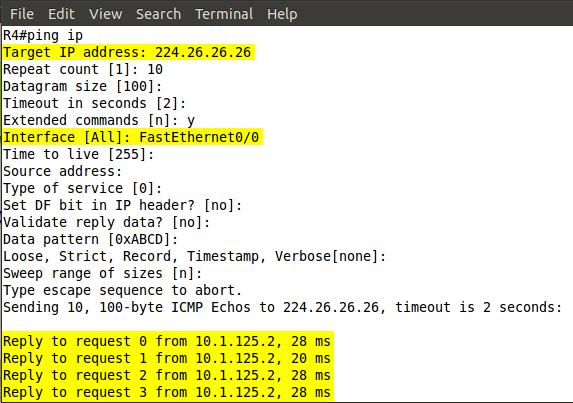 This means, that if there are two senders to 224.1.1.1 (here), the aggregate traffic is 2 x 256 Kbps. Pic. 2 - R3 Limits the Traffic. Pic. 3 - R3 Limits the Traffic. On the multicast segment (VLAN 25), there is only one client wishing to receive multicast traffic. 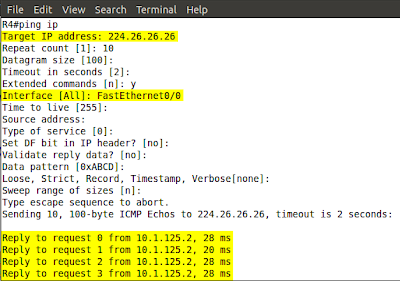 Configure R2 and R5 in such a way that they would stop sending multicast traffic immediately upon receiving IGMP Leave message from this client (default 2.5 seconds). Configure the backup querier on VLAN 25 to assume the querier role if it did not hear the query message in 60 seconds (default time is two times the query interval: 120 seconds). Membership query packets should be sent every 15 seconds (default: 60 seconds) by both R2 and R5. R2 and R5 should force their multicast clients to respond to group query with the group report in maximum 5 seconds (default 10 seconds). The querier for multicast is elected based on the lowest IP address on the link (here it has to be R2). Pic. 2 - DR (designated querier). 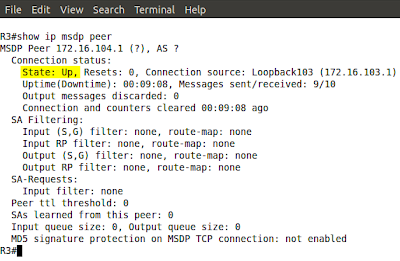 In order to prevent IGMP DoS attacks do not allow R3 to accept more than 10 IGMP states that can be joined to a router from IGMP on its Fa0/0 interface. 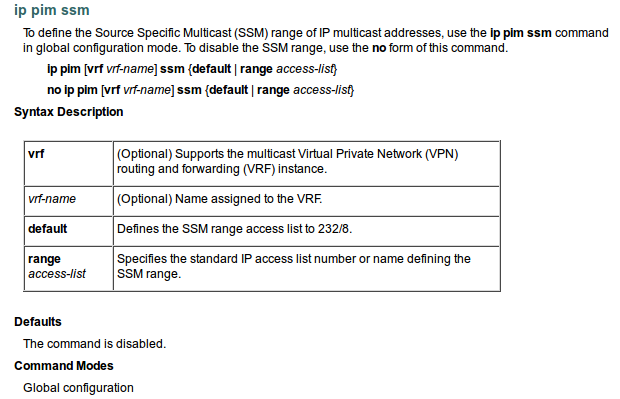 Also, configure filtering so that R3 allows multicast clients only from the group 224.1.1.0/24. 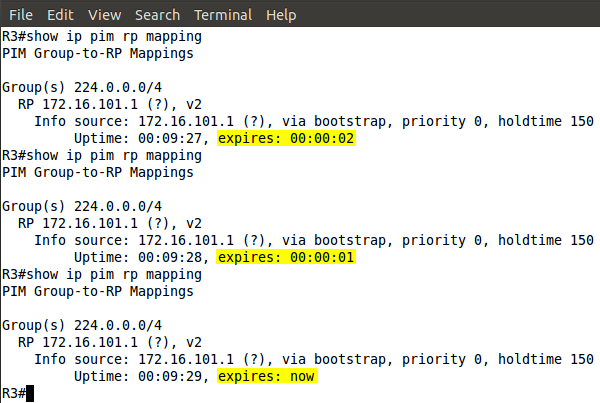 The 'ip igmp limit' command can be used either globally or on per interface basis. Pic. 2 - R3 Fa0/0 IGMP Limit. There are three multicast group joins. The third one is not allowed as per the ACL 1 on R3 (224.3.3.3). It does not get registered. Pic. 3 - Multicast Groups Registered on R3. Routers and switches are already configured as per the topology diagram. All devices use OSPF area 0 as their routing protocol as well as multicast routing. Also, IP PIM Sparse-Mode on VLANs 133 and 143 is enabled. 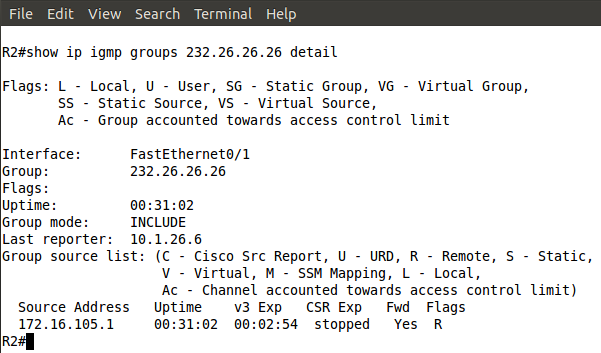 Configure R3 and R4 as RPs for all multicast groups. Ensure that clients choose the closest RP while joining multicast groups (lowest OSPF metric). In case of failure of the closest RP they must be able to use the other one. You are allowed to create extra loopback interface with IP address: 172.16.34.34/32. Pic. 2 - MSDP Peer Session. Routers and switches are already configured as per the topology diagram. All devices use OSPF area 0 as their routing protocol as well as multicast routing. 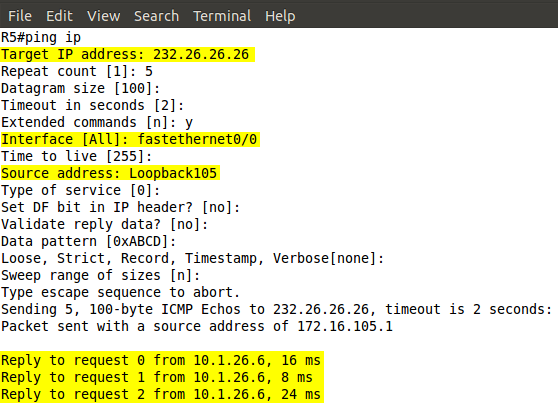 Enable PIM Sparse Mode between R2 and R5 on FastEthernet link. Make sure that users on VLAN 26 can receive multicast traffic sent to 232.26.26.26 only from the source of 172.16.105.5 (R5 Loopback105). Verify your solution. Since the Task 2 stipulates that Source Specific Multicast must be used, IGMP v3 hast to be configured on F0/1 interface. Ensure that users on VLAN 26 can receive multicast traffic sent to 232.26.26.26 only from the source of 172.16.105.5 (R5 Loopback105). Verify your solution. Pic. 2 - Mroute Entry on R2. Pic. 3 - R2 and R3 Mroute Table. Pic. 4 - Ping Test. Pic. 5 - IP PIM SSM Command. Other dimensions and universes which existence we sense, took a more tangible form a few days ago. My friend, artist, who goes by the name Valcari, seems to live in many of them at the same time. He is no longer the same person I have known for ages. Not better, not worse ... just different. Evolution? R1 is to be the RP for all multicast groups. 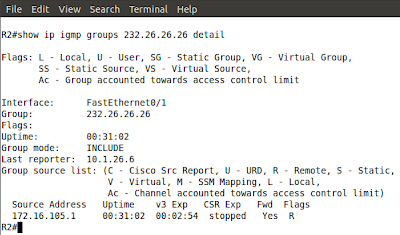 VLAN 26 clients will join the group 224.26.26.26. R4 is going to be server for the group 224.26.26.26. 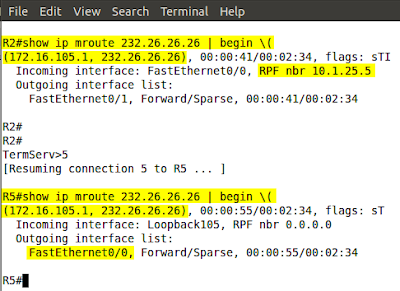 Configure R1 and R2 in such a way that they do not form PIM adjacency over Frame-Relay cloud, but IGMP join messages must be sent to R1 and the multicast traffic from from VLAN 14 should be sent via WAN connection to the clients in VLAN 26. At this stage R1 configuration is not complete yet. I use 'dense-mode' on Serial0/0.125 interface, otherwise the multicast traffic would not be sent down to R2. 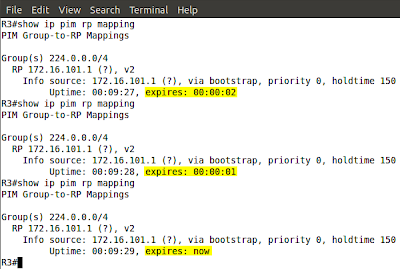 In the next task, I will allow R2 to send the IGMP join-message to be sent towards R1. The ACL will make it impossible for R2 to form PIM adjacency over FR link. 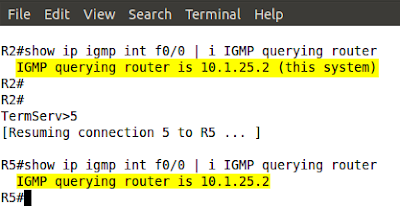 IP igmp helper address is going to forward IGMP join messages received on VLAN 26 interface up to R1. Pic. 2 - PIM Enabled Interface on R2. Pic. 3 - R2 Recognizes R1 as PIM Neighbor. Pic. 4 - R1 Does Not Create Adjacency with R2. Pic. 6 - Multicast Traffic. IP PIM Sparse Mode has been enabled on VLANs: 14, 30, 133, 143. 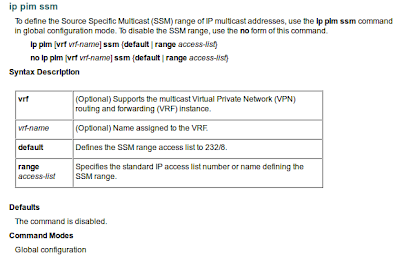 Configure R1 as the RP and BSR candidate for all multicast groups. Use the most stable interface to accomplish the task. Ensure that R3 does not receive information about RP. Pic. 2 - RP Information on R3. Without filtering, R3 receives information about RP. Pic. 3 - RP information on R3. The previous information about RP slowly expires. R3 loses information about RP. Ying and Yang, day and night, one and zero ... so much of this dichotomy. Perhaps if you were good in the first half of your life, in the second you should ... find something interesting ... (LOL). Enable PIM Sparse mode on VLANs: 14, 30, 133, 144. Do not enable PIM protocol on VLAN interfaces of S2 and S4. Group 1: 224.1.1.0, 224.1.1.1, 224.1.1.2, 224.1.1.3 given to one RP. Group 2: 224.1.1.4, 224.1.1.5, 224.1.1.6, 224.1.1.7 given to another RP. Group 3: 224.1.1.8, 224.1.1.9, 224.1.1.10, 224.1.1.11 given to the first RP. Group 3: 224.1.1.8 224.1.1.9, 224.1.1.10, 224.1.1.11 given to the first RP. Pic. 2 - RP (R1) Mapping. Pic. 3 - RP (R4) Mapping. The highest hash value denotes the RP for the group. Routers and switches are already configured as per the topology diagram. All devices use OSPF area 0 as their routing protocol. Configure R2 to be BSR and R5 to be RP. Use the most stable interface on R2 and R5 to accomplish the task. Use R4 to simulate multicast server sending packets to 224.46.46.46. Users on VLAN 26 should receive this multicast feed. Verify your solution. Pic.2 - PIM Neighbors of R1. Pic. 3 - PIM Neighbors of R2. Pic. 4 - RP Information on R4. Pic. 5 - RP Information on R5. 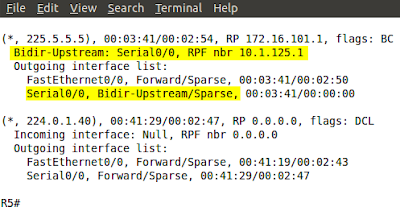 The RP candidate uses default priority 0 (Cisco implementation, whereas the standard uses 192, max. 255). RP with the LOWEST priority (0) is preferred. In PIMv2, a BSR is the equivalent of Mapping Agent used in Auto-RP. BSR default priority is 0 (0-255). Candidate with the HIGHEST priority is preferred if multiple BSR candidates exist. BSR does NOT elect the best RP. The group range to RP mapping is only distributed distributed to routers and they choose the best one for a group. This information is disseminated on a hop-by-hop basis. Pic. 6 - Mroute Table on R2. Pic. 7 - Mroute Table on R5. R5 is the RP for all multicast groups. In the output the RPF nbr 0.0.0.0 implies this fact. The (*,G) entries show up in the client-to-RP path as expected). Pic. 8 - Ping (server feed) from R4 results.